From food to dry goods, Carcar delicacies and specialties are created with the Carcaranon values of hard work and creativity. Take for example the Carcar lechon. While it is roasted the traditional Cebuano way, the Carcar version comes with a strange and delicious twist – its own special sauce. This special mix of ingredients – which include a local herb indigenous to Carcar called “patiotes” – serves as seasoning for the pig during the roasting and sauce when it is served. Carcar’s roasted pig is sold by the kilo at the Carcar Public Market. You can eat your lechon there or have it wrapped. Don’t leave the city without trying its signature lechon. Carcar lechon is sold by the kilo at the City Public Market. The public market is of walking distance from the Carcar rotunda and church complex and a tricycle ride from farther distances. Perhaps a good cuisine to pair with the lechon is the paksiw na isda, a specialty of eateries at the market. Carcar’s paksiw (usually tuna) has the distinct quality of being very soft-textured, owing to the “palayok” or “kun” where it is cooked. The “palayok” distributes the heat evenly inside that the cooked fish dish almost melts in the mouth when eaten. The Carcar rotunda is where guests buy the city’s delicacies. No other place in Cebu makes the best chicharon than Carcar. 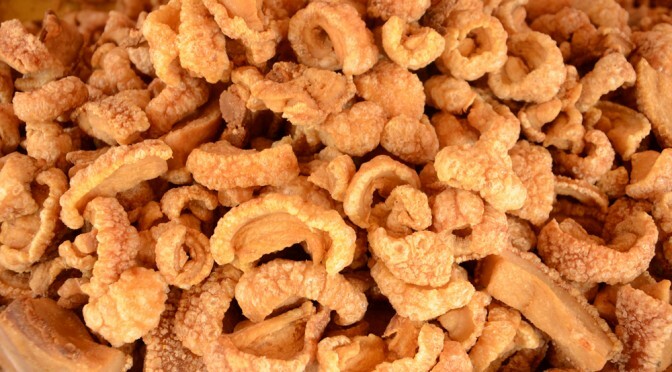 The pork skin cracklings come in two variants: the “kubal” or purely pork skin and the chicharon which still has traces of meat. Whichever you prefer, they come perfect with plain vinegar. Carcar locals can point out the best places to buy chicharon, and kiosks along the rotunda also sell products from different suppliers. Ampao or rice crispies is a popular Carcar specialty. People with sweet tooth would appreciate the ampao or rice crispies sold just about anywhere in Carcar City. Carcaranons have been making and selling them forever. Aside from the rotunda where these are sold in abundance in kiosks or single table stores, ambulant vendors bringing these goods in packages would board buses when they stop by the town and sell to passengers. Another product distinctly Carcar is the bocarillo (candied coconut strips). It comes in colorful shades of pink, blue, green, yellow and, like other Carcar delicacies, is sold throughout the day in the city center. Ambulant vendors who run after buses and private vehicles carry them around and offer them in packs of three for only P50. Carcar’s bocarillo is popular with locals and tourists. This city known for its heritage structures is also home to small shops that manufacture quality yet affordable shoes sold at a site in Barangay Valladolid called the Carcar Shoe Expo. When in Carcar, don’t forget to try out the delicacies and bring home a few pairs of those Carcar-made shoes. Carcar shoes are known for being durable and affordable. The area is just a tricycle ride from any point in Carcar’s central business district and drivers know where it is. If you get tired shopping for footwear, a restaurant within the expo area serves refreshments and meals. If you’re bringing your own car, there’s ample parking inside. Carcar City is approximately 40 kilometers from Cebu City and just an hour away by bus or 45 minutes by private transport. Buses leave for Carcar hourly from the South Bus Terminal along N. Bacalso Ave.